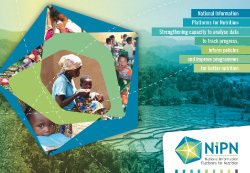 The NIPN initiative is driven by the European Commission’s Directorate General for Cooperation and Development and also supported by the United Kingdom Department for International Development and the Bill & Melinda Gates Foundation. Taking into consideration the substantial progress made towards the Millennium Development Goals and recognizing under-nutrition as a major global challenge, the EU has committed to an ambitious objective: to support partner countries in reducing stunting by at least 7 million by 2025, corresponding to 10% of the World Health Assembly target. Around this objective the EU adopted in March 2013 its Nutrition policy framework “Enhancing Maternal and Child Nutrition in External Assistance: An EU Policy Framework”. Related to this Communication, the European Commission developed an Action Plan on Nutrition setting out how the Commission can work to improve nutrition at the national, regional and international levels. The Department for International Development (DFID) leads the UK’s work to end extreme poverty, building a safer, healthier, more prosperous world for all of us focusing on children under the age of five - who are undernourished or at risk of becoming so - and their mothers. DFID has a globally recognised and effective nutrition programme. It has played a key role in mobilising the global community to combat undernutrition and in setting the global agenda. DFID started scaling up its nutrition work in 2010 representing as well nutrition-specific projects that seek to combat undernutrition directly (through health interventions) as nutrition-sensitive ones that do so indirectly (through investments in food security, sanitation and hygiene and social welfare). DFID’s work is based on strong evidence but greater focus is needed on interventions that will maximise impacts on stunting in the local context. exploring new approaches, such as improving nutrition for women and adolescent girls, increasing advocacy and technical assistance, improving data systems, and strengthening food systems. The long-term goals associated with this strategy are to prevent 1.8 million malnutrition-related deaths by 2020 and to develop and test new solutions to address the burden of malnutrition that cannot be alleviated using existing interventions.